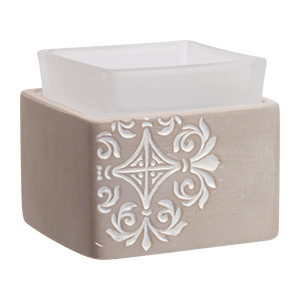 Fitzgerald Scentsy Warmer is a cement-like stoneware, debossed with a hand-painted crest lends traditional detail. The frosted glass dish and squared design make it look new and modern. The beautiful square frosted glass top, mixed with the cement-like stoneware, boasts a stunning etched design and will be a long-lasting addition to any room. The Fitzgerald Scentsy Warmer has a modern pattern look, and since there’s no light, it’s the new favorite for bedrooms. This warmer is the perfect accent in any space, including an office, craft room, dorm, or studio. Fitzgerald would make a great gift for any occasion. Add a few squares of your favorite Scentsy Bar and let it delight the senses. 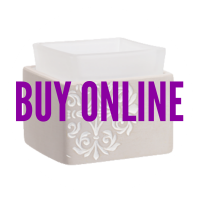 The Scentsy Fitzgerald Warmer is 3.5” tall and includes an electric base, and a warming dish. This electric candle is part of the Element Collection and uses a warming plate to gently melt our wax. No Scentsy light bulb is needed with Fitzgerald.